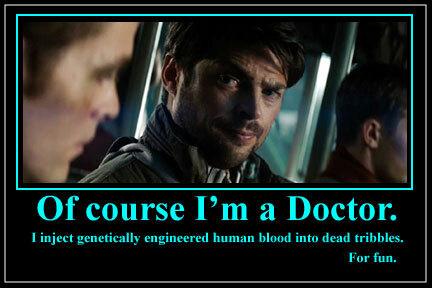 While I finish up a another post about the Star Trek Into Darkness film, I made another meme about the greatest Doctor ever- Leonard McCoy. This is one of the things I mentioned in a post right after I saw the movie in the theater. Yet another one of the preposterous occurrences that flood the story. I hope you enjoy the pic. As a Doctor, one would think the scientific method would hold true to laboratory testing even in the future, but Bones goes the extra mile and does something so ridiculous it's quite a wonder that ANY of Into Darkness' 3 writers would've thought this up at all- the "experiment is to inject the single vile of Khan's super blood into a tribble. A dead tribble to top things off. I'm a Doctor, not a scientist. As a patient care worker that frequents the Cardiac Cath Labs, I see pig valves used in people decently often, and a variety of other cross species uses for medical procedures. I've even read of sea coral being used as bone replacement. But what gets me is, what would posses McCoy to put the sample of genetically engineered human blood into a dead wad of fur? It makes no sense, like most of the rest of the movie in general really. So much for the scientific method.